Texas Attorney General Ken Paxton is fighting the legal action brought by three University of Texas professors asking a federal court to block the campus carry law. The professors are asking for a temporary injunction. The AG has filed a brief opposing judicial action that would enjoin enforcement of any statute or policy that allows LTC (licensed to carry) holders to conceal carry in classrooms where the plaintiff professors are teaching. In a 26-page brief filed opposing the request for a preliminary injunction, the AG argues that the professors have failed to satisfy any of the legal requirements for a preliminary injunction. The brief argues that the professors are not likely to succeed on the merits of their claims, there is no substantial threat that they will suffer irreparable harm if the injunction does not issue, the balance of harms favors the Defendants, and the public interest supports denying the legal action that the plaintiff professors seek. 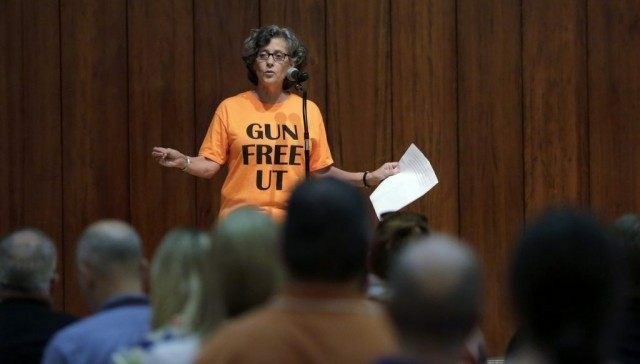 As reported by Breitbart Texas, Texas’ campus carry law went into effect on August 1. Pro-gun advocates worked throughout the 84th Texas Legislative Session to pass campus and open carry bills. On May 31, 2015 the Texas Legislature passed SB 11, the “Campus Carry Bill,” as reported by Breitbart Texas. Texas Governor Greg Abbott signed the bill into law on June 13, 2015. The campus carry law went into effect on the anniversary of the first mass-shooting in the nation. On August 1, 1966, a Marine who had been trained as a sniper, killed and wounded approximately 45 people on the University of Texas campus before he was gunned down by authorities. Charles Whitman climbed to the top of the 27-story clock tower in the middle of the university armed with a shotgun, rifles, and pistols. He engaged in what is considered the first mass shooting assault on civilians, as reported by the AP. He had already killed his wife and his mother before he climbed those stairs.